It often happens in gastronomy that improvisation and fortuity are cited as the inspiration for some of the world’s most iconic dishes. How, for example, did anyone ever come up with the idea of crushing garlic in a mortar, adding a slow trickle of oil and stirring constantly until aioli formed? And, was it really a case of absent-mindedness that led to the legendary tart Tatin, when a distracted chef put chunks of apple into a pie tin before pressing in the crust? Instances abound of dishes whose origin is attributed to chance. 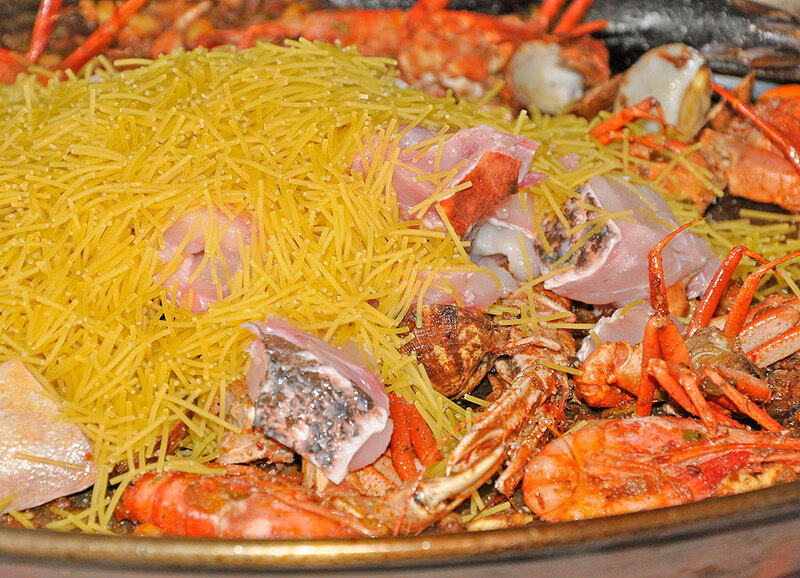 Indeed, one of them features on our menu: fideuá, a fine example of sea-based local cuisine. Our neighbors from the mainland town of Gandía (Valencia) take credit for having been the first to concoct it, though they disagree on the anecdotal circumstances. Some defend the theory that the dish came into being on board a trawler in the 1910s. The cook was making paella, but when it came time to add the rice, he discovered that he had run out. In order to salvage the dish, he threw in what he had on hand: spaghetti, which he broke into bite-size pieces with his hands. Others, who place the incident in the 1930s, claim that a seaman named Bautista invented the dish. As the story goes, the captain liked paella so much that, whenever it was served, the rest of the crew were left with barely a morsel. Bautista decided to substitute angel hair pasta for the rice in an attempt to make the dish less appetizing. Instead, he ended up creating a new sensation. Despite the fact that these anecdotes – two of the many that circulate around the eastern coast of Spain and the Balearic Islands – are at odds with each other, what most likely is true is that the dish originated in Gandía, based on the fact that it was here that the First Fideuá Contest was held in 1975. Since then, the event has been an annual fixture there. 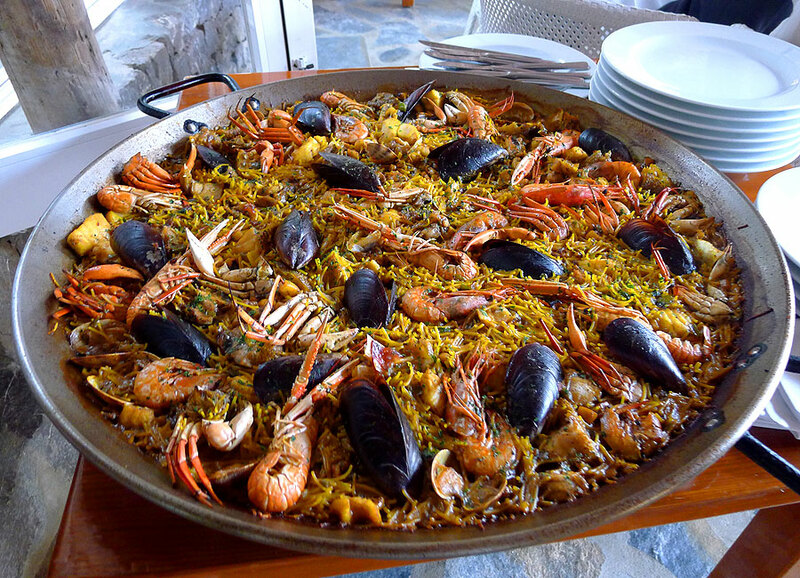 In Ibiza we do not know exactly where or when fideuá made its first appearance. We can imagine a tableau in which fishermen spent long days and nights at their seaside huts, cooking whatever they had to hand. If they ran out of rice, it would have been convenient to switch to pasta. And, in fact, as far back as living memory reaches, this is what islanders have done, though who got the bright idea first remains anonymous. In any case, leaving that debate in the realm of speculation, some of our regular customers have confessed they come to our restaurant specifically to eat fideuá. Without a doubt, it is every bit as delicious as a fish and seafood paella because it contains most of the same ingredients: sofrito along with fresh cuttlefish, fish and seafood in a rich reduction. The main difference is that rice is substituted for angel hair pasta, which, in our opinion, locks in flavor as well as the thicker macaroni “elbows” traditionally used and is also smoother on the palate. We finish off our preparation with a hot oven, which makes the pasta stand on end, a curious delicacy. We recommend enjoying fideuá with a cool white wine under the shade of one of the Phoenician junipers on our terrace. Bon appétit!